Pleated Post Motor Filter for the PowerGlide with Lift-Off Technology Upright Vacuums - Fits Series 2763 and 9182. 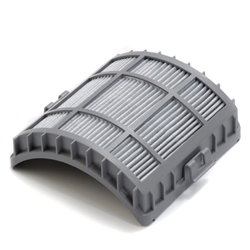 Filter is not washable and is recommended to be changed with a new filter every 6 to 8 months depending on use of the vacuum. It is a good idea to tap the filter over the garbage after each use to keep the vacuum suction at optimal levels.